Every session includes a Planning Appointment where we will discuss the goals you have for your session, as well as location choice and clothing selection. A fully guided Photography Shoot with 2-4 hours of photography time, including professional hair styling & makeup for one person, and 2-3 wardrobe & styling changes. A Portrait Reveal & Ordering Appointment for you to view a selection of 20 or more fully retouched images, and to purchase the ones you love. Please note that the session fee does not include any printed or digital images - they must be purchased separately. In-studio sessions are available Monday through Saturday starting at 9:00 am only. On-location sessions are available Monday through Saturday from May 15th - October 15th. Session times start between 4 - 8 pm depending on the season. Choose a la carte portraits, a pre-designed collection, or a combination of both! 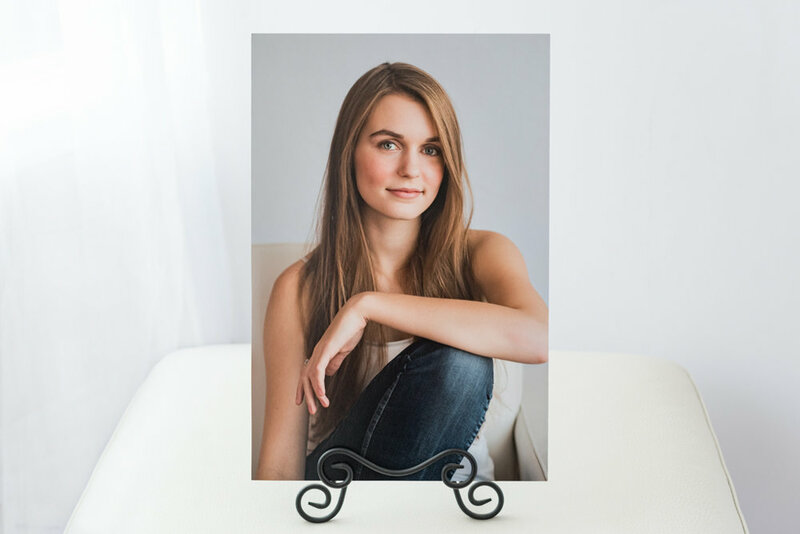 These fully retouched portaits are 7x10 sized, are displayed in an 11x14 acid free white mat, and are ready to display on an easel or in your own frame. They also come with their matching "print ready" digital image. If you choose more than 6 Individual Portraits you may want to consider a Portrait Collection. 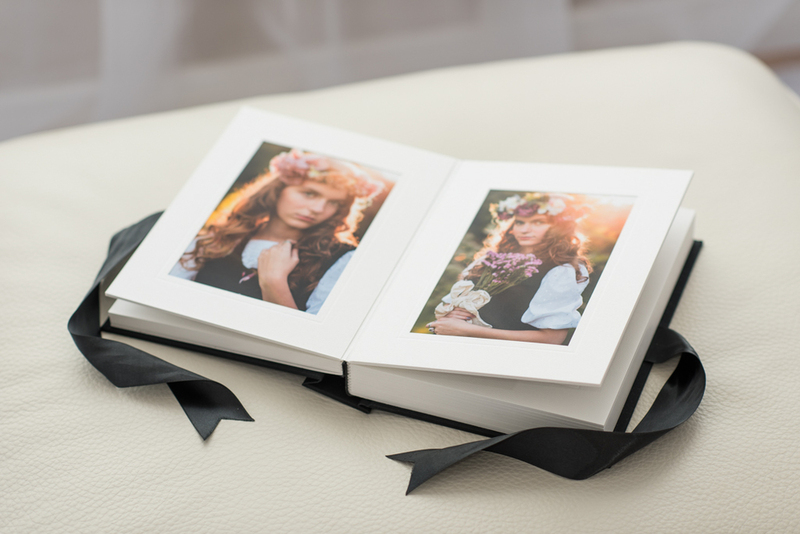 These collections include a selection of Individual Portraits, the matching "print ready" digital images, and come in a beautiful black linen covered folio box. All Portrait Collections also include a mobile album so you can easily share your images with family and friends. 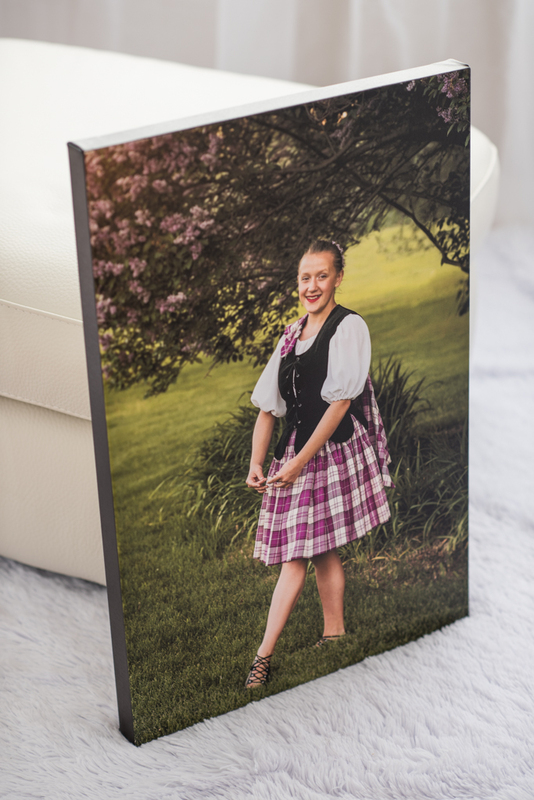 Your 7x10 Individual Portraits are presented and delivered to you in an 11x14 acid free white mat. They are ready for framing or display on an easel, and come in an attractive presentation box which has a rich black linen finish and silky black ribbon tie closure. "Print ready" Digital Images are perfect for web use and are also printable up to 8x12 size. A Mobile Album lets you view your images on your mobile device and easily share them with family and friends. Ordering printed portraits gives you the assurance of receiving a high quality, archival quality piece of art. mounted on black styrene board, and are ready for you to put into your own frame. Wall portraits include their matching "print ready" digital image. Your favorite portrait is framed and ready to hang in your home. 8x10 size comes with easel back for displaying your portrait on a desk or table. Choose from several different color and moulding options. 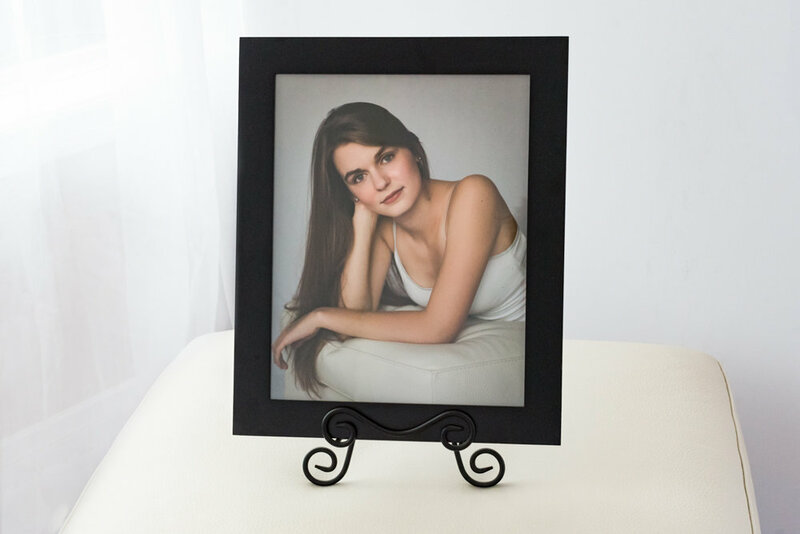 Framed Portraits include their matching "print ready" digital image. and wrapped around a hand-crafted solid wood frame. These gallery wraps are 1.5" deep and finished with a wire hanger, corner bumpers, and black paper backing. Fine Art Canvases include their matching "print ready" digital image. All framed prints and fine art canvas pieces are ready to hang in your home. Optional professional in-home installation is free of charge. 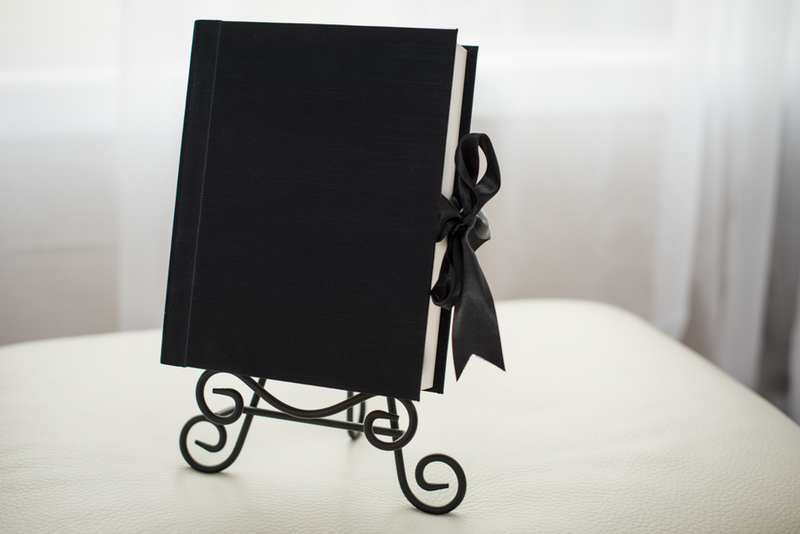 Create a cherished keepsake with a session album for yourself, or to gift to someone you love. and hold either 10, 20 or 30 - 5x7 sized matted images. Greeting cards are press printed on matte paper with a gloss coating on the front. The cards are flat, 5x7 sized and are printed on both sides. They come in a package of 25 and include white & silver envelopes. Choose from various template options. Greeting Cards include the matching "print ready" digital image. however, some clients prefer to only recieve digital images. What is a "print ready" digital image? "Print ready" digital images are full resolution digital images delivered to you by digital download in the jpeg format. They are sized and formatted, and licenced to you so that they are printable up to size 8x12 only. They are NOT suitable for printing any larger than this because the image will be distorted. They are also not licenced to you for printing any larger than 8x12. If you are interested in having a wall portrait made from one of your images please see the options available above. Print ready images are perfect for making small keepsake and gift prints, sharing on social media, and to keep for archival purposes. Please see my studio policies page regarding copyright information, or contact me if you have any questions. Gift certificates are available in my online store. Please click here! If you would like to create a custom gift certificate please contact me. Please contact me if you have any questions or would like to see product samples. GST and shipping are extra.